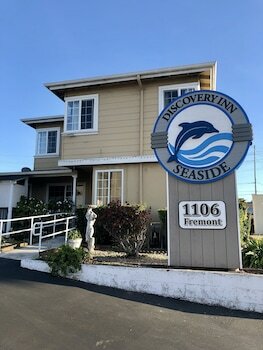 When you stay at Discovery Inn in Seaside, you'll be near the beach, within a 15-minute drive of Fisherman's Wharf and California State University Monterey Bay. Free self parking is available onsite. With a stay at Economy Inn Monterey in Seaside, you'll be within a 15-minute drive of Fisherman's Wharf and California State University Monterey Bay. Free self parking is available onsite. With a stay at Traveler's Hotel in Oldtown Salinas, you'll be within a 5-minute walk of National Steinbeck Center and Aguila Cultural Center.